The input line segments are replaced with geodesic segments and written to the output. The end points of the segments will be connected using a geodetic approximation. The input segment type is irrelevant; linear and non-linear (circular arc, elliptic arc, and Bezier curve) segments with common end points will yield the same output. No output feature will be written for input features made of a single segment with coincident start and end point. For example, a polygon feature made of a single circular arc will not be written to the output. The input line or polygon features. The output feature class containing the densified geodesic features. The type of geodetic segment to construct. Geodetic calculations are performed on the ellipsoid associated with the input data's coordinate system. GEODESIC —The shortest distance between two points on the surface of the spheroid (ellipsoid). LOXODROME —The line of equal azimuth (from a pole) connecting the two points. GREAT_ELLIPTIC — The line made by the intersection of a plane that contains the center of the spheroid and the two points. NORMAL_SECTION —The line made by the intersection of a plane that contains the center of the spheroid and is perpendicular to the surface at the first point. The distance between vertices along the output geodesic segment. The default value is 50 kilometers. 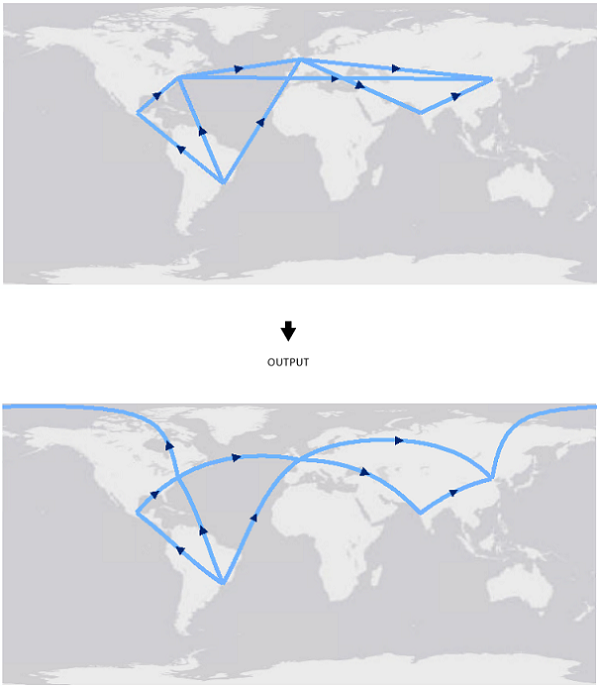 Simple example of running geodeticDensify tool in python.